Great Caesar's Post! » Blog Archive » It’s Kalimánday! Make way for … Makón! It’s Kalimánday! Make way for … Makón! 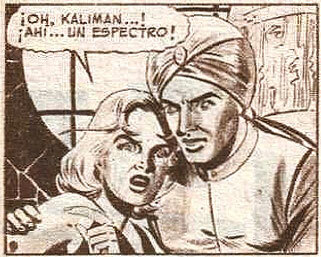 When we last saw our friend Kalimán in the comic pages, he and his newly acquired orphan/ward Solín were traveling through Egypt, beating up Bedouins, getting shot at and choking cobras at their leisure. 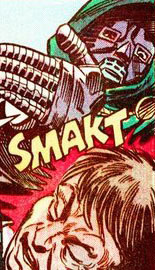 (That’s not a euphemism — this ain’t an early Batman comic.) Since then … well, a lot has happened so let’s sum it up. Kalimán, taking some time out from dispensing justice in the Egyptian desert, has visited his friend and archaeologist Professor Farrel. Farrel is on the verge of making a major discovery concerning the Tombs of Ramés, and has been getting unwelcome attention because of it. Joined by his daughter Jane and his protege Zarur (who is originally from the area), the professor asks Kalimán for help, which is a good thing since Jane is promptly kidnapped. Jane isn’t even the first victim; Nila, who is the daughter of Alí Faruf — King of the Sons of the Desert — has already been kidnapped by the sinister Eric Von Kraufen, who is hiding out in a pyramid chock full of ghouls, zombies and assorted Things-That-Are-Not-Good-For-You. There may have been a pit full of crocodiles. Nila is also the (so far secret) promised bride of Zarur going back to an arrangement made when the two were still children. 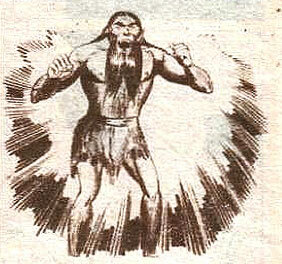 The hot-headed Zarur loves Nila, and is determined to save her from Von Kraufen. 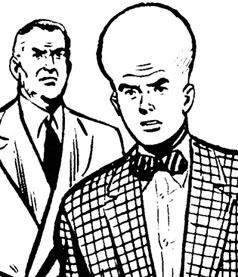 When he’s not busy polishing his +3 Monocle of Evil, Von Kraufen is the one harassing Professor Farrel, believing the archaeologist can get him into the Tomb of Ramés. The tomb will give Von Kraufen access to treasure and power and even more treasure and power, and then he can really start messing things up! Mwa-hahaha!!! 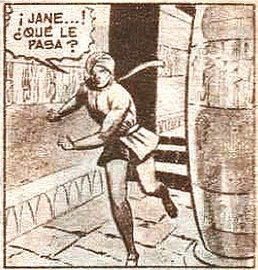 Eventually, Kalimán and his group rescue Jane, then make their way into the pyramid lair where they start running into one horrific creature after another. None, however, make an entrance quite like … Makón! Prof. Farrel: It’s Jane, my daughter …! Kalimán: Let’s go that way! 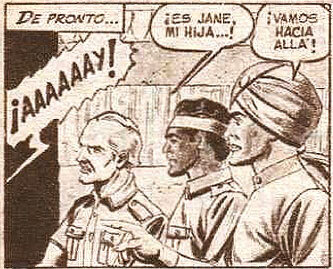 Jane: Oh, Kalimán …! Ah! A spectre!